This afternoon, Centcom confirmed the USS Jason Dunham, a guided missile destroyer stationed in waters near the Persian Gulf, had discovered 2,521 AK-47 rifles "that plausibly derive from Iranian stockpiles, according to Conflict Armament." "As a part of our counter-trafficking mission, we are actively involved in searching for illegal weapons shipments of all kinds," Vice Adm. Scott Stearney, commander of U.S. Naval Forces Central Command, U.S. 5th Fleet, and the Combined Maritime Forces, said at the time. "Ensuring the free flow of commerce for legitimate traffic and countering malign actors at sea continue to be paramount to the U.S. Navy and its regional partners and allies." 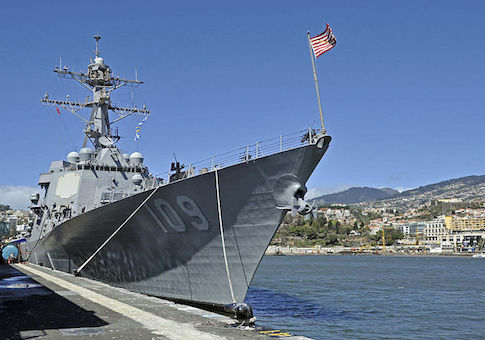 The mystery ship "was determined to be stateless following a flag verification boarding, conducted in accordance with international law," according to U.S. military officials. "The origin and intended destination of the skiff have not yet been determined."